If you have been in search of the perfect saltwater aquarium kit, the all-in-one Biocube Aquarium from Coralife may be just what you’re looking for! 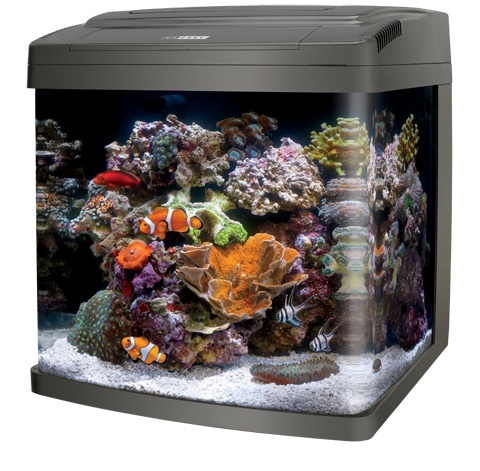 Equipped with vibrant LED lighting, a quiet, submersible pump, and other great new features, this Biocube 32 gallon aquarium makes a great beginner saltwater aquarium. The aquarium features a sleek and modern hood with LED lighting, with daytime and nighttime settings. This popular Biocube aquarium is one of the best all-inclusive aquariums since the oceanic biocube. This Biocube 32 gallon aquarium uses the latest LED technology for energy-efficient lighting. The aquarium is two inches taller than the original, creating a larger and clearer panoramic view. Dimensions: 20-1/4" x 21-7/8" x 21-1/2"